Enjoy free UK delivery with any orders over £60! Add the finishing touch to your outfit. Our stylish, extra roomy footwear for men and women is perfect for all summer occasions. Plus get free delivery (UK standard) worth £4.99 when you spend £60 or more! Add the finishing touch to your outfit. Our stylish, extra roomy footwear for men and women is perfect for all summer occasions. Plus get free delivery (UK standard) worth £4.99 and free returns when you spend £60 or more (terms and conditions apply - see below*). 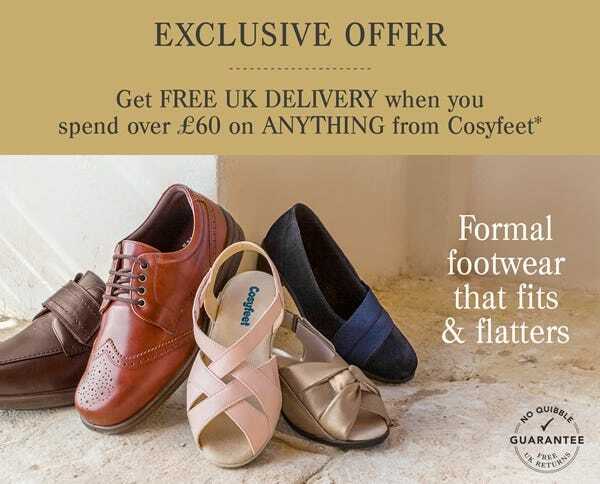 To redeem our free delivery offer (UK standard) on all orders of £60 or more, simply add any item/s worth £60 or more to your basket and enter the code CFJULFP when prompted. Free delivery (UK standard) will be applied to the order. This offer expires at 11.59pm on Sunday 8th July 2018. Cannot be used in conjunction with any other offer. Offer available on in-stock items only and/or if all items are in stock. We reserve the right to withdraw this offer at any time. Thank you for your comment. One of our Customer Service advisors has emailed you regarding some recommended styles.